For the highest effluent quality at the lowest power consumption on the market*, choose the QuickOne+. The Biocell Domestic QuickOne+ is among the best selling domestic wastewater treatment plants by Biocell Water. The most impressive feature of this home sewage system is that it produces the the highest effluent quality with the lowest power consumption on the market [see our our CE declaration independent test certificate and EN12566-3 test]. 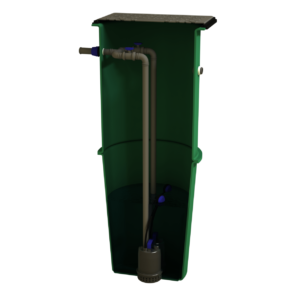 The simple design comprises a strong single piece water tight tank made from reinforced HDPE (plastic) with a flat base for easy installation. This shallow dig tank is suitable for below ground installation in all soil conditions without needing a concrete backfill – saving time and money on costly installation works. The QuickOne+ domestic sewage system is suitable from 4 up to 48 persons with gravity and pumped outlet models available. It is SR66 certified and British Water approved. The Domestic QuickOne+ home sewage treatment plant uses a process powered totally by air and naturally occurring bacteria. There are no moving parts inside the tank and it doesn’t require any chemicals or additives. This trouble free home sewage system operates quietly and without any unpleasant smells. Our end users can enjoy total peace of mind from one of the most reliable, tried and tested septic systems on the market. If you are a homeowner and you need to buy a home sewage treatment plant, the QuickOne+ is the ideal low cost choice for domestic wastewater treatment. In more ways than one, you will benefit from significant savings in terms of initial installation costs, running costs (from as little as €0.10/£0.08 per day) and industry leading desludging intervals because the QuickOne+ produces less sludge than the competing domestic sewage systems on the market. For additional peace of mind, we provide a nationwide customer support service and for long term care we offer value for money maintenance packages to keep your new home sewage treatment system in top working order. 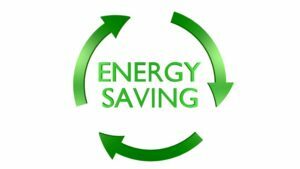 Similarly, installers and builders can benefit from significant cost savings with a trade discount. We have made the installation process as quick and as simple as possible. 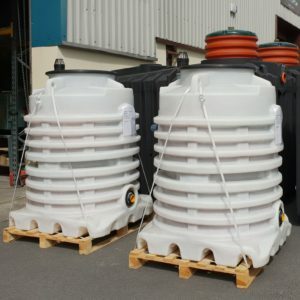 The single piece high density HDPE tank is reinforced with stainless steel so no concrete is ever required and is guaranteed to be watertight . A mini digger is perfectly suitable for installing this shallow dig tank. 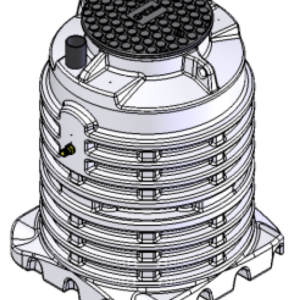 It has a flat base for simple installation (unlike curved or cone-shaped tanks that are difficult to install) and risers for deep installations. Another advantage of the Biocell Domestic QuickOne+ is that it is plug and play i.e. 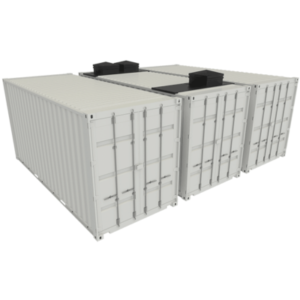 a complete packaged plant that is ready to go. Once an order is placed we offer quick turnaround times and a rapid nationwide delivery service so contact us today for a free quotation. 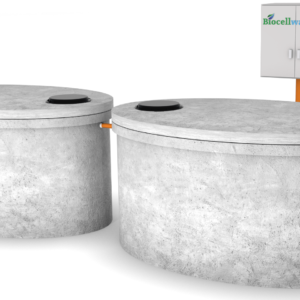 How does the Biocell QuickOne+ Home Sewage Treatment Plant work? Firstly, raw sewage from the house flows into the sewage treatment plant. Then, the small air blower activates and runs in an on/off cycle aerating the wastewater via the bubble diffusers. This serves to mix the wastewater and to totally aerate the wastewater. Following that, naturally occurring bacteria in the wastewater develop in the aerated wastewater. They feed on the organic material and nutrients in the sewage, totally treating and cleaning it of contaminants. The aeration process supplies the bacteria with abundant oxygen, allowing them to multiply and clean to industry leading standards. Finally, the settlement phase occurs after the aeration and cleaning has happened. During the settlement phase, any remaining fine solids in the wastewater settle to the very bottom of the tank producing sludge. There is no electricity used during the settlement phase. The treated water at the top of the tank is totally cleaned and ready for discharge to the soakaway or stream/watercourse. Our experienced technical sales team are here to help guide you through the process and ask the necessary questions. Simply get in touch using the contact form or give us a call. We are happy to provide you with a free quotation or to provide extra information about any of wastewater treatment plants and products. We look forward to hearing from you. I would highly recommend Biocell and the QuickOne+ treatment plant for self builds, the team are very helpful and friendly if you have no experience and loads of questions! The price we got from them was the best of all the quotations and we got a very good deal on a maintenance package with them too. The installation was done in a day so absolutely delighted. -Why is this important if the sludge is going to be disposed of down the sewer pipe in the first place? -What capacity of this sludge is stored in the tank and how is it removed? 2. Is there a system that offers a solution to tackle the sludge after you have processed it? Hi Scott, thanks for your interest in the QuickOne+ and your questions. Firstly, sludge is not disposed of down the sewer pipe – it accumulates inside QuickOne+ which has a total capacity of 3,500l. Like all treatment plants, the sludge should be removed on a regular basis by a professional sewage disposal company who pump it out and take it away for disposal. This is the most economical way to tackle sludge in domestic systems. If you have any other questions, don’t hesitate to get in touch. Great price and service. Really quick and tidy installation too. Thanks to all at Biocell. Just believe the reviews and get one. Had mine installed and running for three months now and completely problem free, also almost noiseless. Thanks for your question Ken. The process the QuickOne+ uses stabilises the sludge produced – thereby reducing volumes produced relative to other systems. So while sludge is produced, the volume is minimal. Aerobic stabilisation is performed simultaneously in our QuickOne+ plant, whereby primary and secondary sludges are continuously aerated for long periods of time. In aerobic digestion the microorganisms extend into a respiration phase where materials previously stored by the cell are oxidized, resulting in a reduction of the biologically degradable organic matter or sludge. If you have any other questions, feel free to leave your contact details using the contact and we’ll get in touch. The honest answer is that this is probably the best systems on the market, hence all the good reviews. Its the only sewage treatment plant on the market with stainless steel reinforcement internally. And the independent test certificate from PIA Gmbh in Aachen [notified CE marking tact facility] shows the Biocell QuickOne has the best effluent quality ad lowest energy use of any available system. Please email us with your details and we will send on all info to demonstrate this. Thanks for your comments. Was confused about what plant to go for until I compared all the systems Independent test certs. The Biocell plant has way lower running costs and way higher treatment levels. I dont know what anyone would buy elsewhere. A highly engineered product. Recommended. Good advice, good product. Recommended. My installer was very pleased when he hears I had purchased a biocell plant. Watched the installation and it looked like a really high quality bit of equipment. Completed significant market research. A huge range of products out there. Many seem to make false claims. I found out that every plant has an independent test certificate showing power use and treatment standards so just compared these and went for the quickOne then. Easy choice in the end. When it arrived I knew I had made the right decision. The quality of the product was instantly visible. Barely noticeable in the garden after installation. Had one of these installed as part of an upgrade. Very minimal visual impact with small green lid. I build 5 houses a year and I am in business 20 years. Most of my work requires an off mains drainage solution. These tanks are simply the best engineered tanks on the market. When you see this tank arrive you will be pleased you went for one and avoided some of the other rubbish on the market. I have seen it all. Green lid is very handy also – you can hardly see it in the garden. Good job biocell! Ordered Christmas week. Installed over Christmas. Had loads of visitors so it got a very good test and all good!! Very good tank. I am very pleased with my choice. Winter is coming. We have had serious issues with our old system for the last few years. Its becomeing a nightmare emptying it. Was out there on christmas day last year. Got a few quotes last year but we could not afford it. Was speaking to my cousin recently who built a new house and got a tank from biocell. I had given up on it at this point due to my budget, but said I would call them as my cousin insisted. Anyway. I wont write an essay – but they did a full assessment, then gave me a price, then did the work and actually stuck to the price [!!!!] and im looking forward to a winter where I am not out in the garden every week pumping out the tank. Dont write reviews but making an exception here. Building 5 houses to sell. Got excellent advice from the biocell guys on my soakaway system also. All approved by the local council and installed a 25 pop system. Good value for money. Will use them for my next project. They installed a system for my local school – so thats how I heard about them. Live beside a lake. Building control imposed very strict treatment standards. Biocell has the good standard at a good price. Installed by my groundworker and he said it was a great tank. Im no expert but it looked like a serious piece of kit. Building a passive house. The Biocell quickone has the lowest energy of ANY system I came across. Also has an amazing level of cleaning. I was very surprised at some systems on the market. Their electricity use is just HUGE. The biocell unit ticks all my boxes. We are a drain cleaning company that does the odd install. Sales guys were straight up with answers to all my Q’s. Installed the tank 4ft below the garden level without a problem. Im happy and my client is happy. I used it to replace a leaky concrete tank that has been a nightmare. Went for the biocell as it had a lower electricity use than any other system. Retiring soon so every penny counts. Have my own digger. Have installed approx 3 tanks over last 10 years. This was the best yet though – which is great as its for my daughters house. Lovely shallow dig tank. Serious strength in the tank. didnt have to be careful with the install. Have been keeping an eye on it for last few weeks and its A1. It was my job was to review and choose a sewage system for our new self build for my husband. Happy with the system. No problems during installation or operation. Nothing to compare it to really though so 4 stars. Was worried about noise as my neighbour has a different brand of system installed and it is very noisy. They guys at biocell said it was quiet. I took the chance and I am 100% satisfied. Compared to the neighbours unit the difference is shocking! All good. Installed now. Digger guy said he was very happy to be installing it as the reinforcing makes his job very easy. However, -1 star as was supposed be delivered tuesday afternoon but didnt arrive until wednesday morning. to be fair they did say that they could not guarantee next day delivery due to my location. But I am a harsh critic! Did a bit of research and went for the Quickone domestic. No complaints. Good service. Needed a system fast. Delivered 1 day after order. Very impressed with tank when it arrived. DIY installer here. Installed now and working perfectly. Would barely know there was a system in the garden.